Seal of the dictatorial government, 1898. While Filipino revolutionary leaders were confident of victory and had their sights on a post revolution era, the Americans had yet to settle their own war with Spain. Filipino forces had taken almost the whole of Luzon and had the city of Manila, the seat of government (Intramuros) under siege. Cut-off from the rest of its suburbs without food and water supply, its capitulation was believed to be only a matter of time. U.S. admiral Dewey on the other hand, had no control beyond the harbor and was waiting for the U.S. Volunteer Eighth Army being assembled and trained at the Presidio in northern San Francisco, California. Without an army, the United States could not engage the Spanish forces on the ground. Filipinos were fighting their war and winning the revolution without American assistance. On June 12, 1898, Philippine independence was declared in Kawit, Cavite. Local governments were then reorganized and to achieve political stability, an election for delegates to a representative congress was decreed. 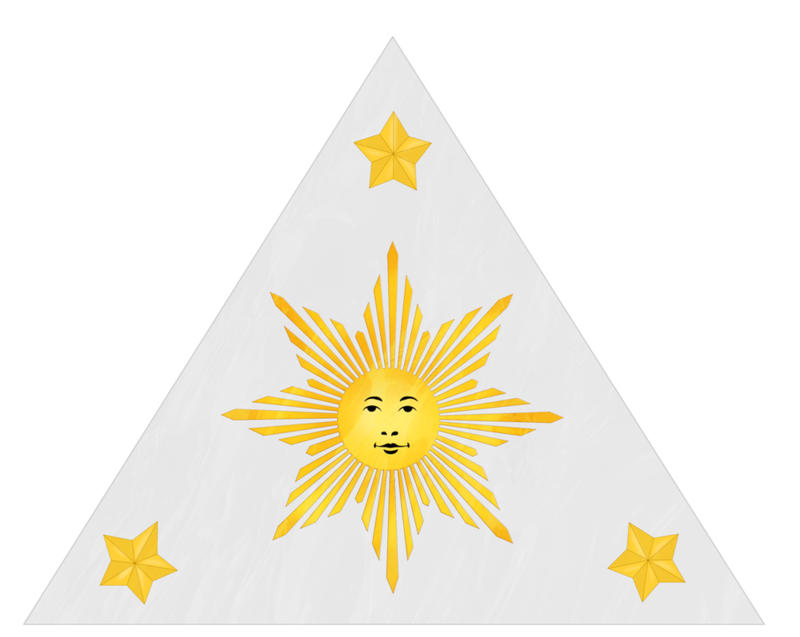 On June 23, 1898 Aguinaldo's dictatorial government was replaced by a revolutionary government and the departments of Foreign Affairs, Navy and Commerce; Finance, Agriculture and Manufacturing Industry; War and Public Works; Police and Internal Order, Justice, Education and Hygiene were created. Diplomatic representatives were also appointed. Things took a different turn when American reinforcements came. The U.S. government sent three expeditionary forces; the first arriving on June 30 under the command of Brigadier General Thomas Anderson; the second on July 17 under Brigadier General Francis Greene and the third, led by Brigadier General Arthur Mac Arthur on July 31, 1898. Major General Wesley Merritt who arrived on July 25 took over-all command. General Merritt, and newly promoted Admiral Dewey, started planning the assault of Manila. General Aguinaldo was not consulted. It was reported that Governor-General Basilio Augustin was inclined to surrender the Philippines and while American forces were en-route to Manila, the Governor General was relieved by General Fermin Jaudenes y Alvarez. Cuba was surrendered on July 16 when the city of Santiago fell. Jaudenes could not accept defeat in the hands of the Filipinos. His option was to surrender to the Americans, but pride dictated that it should be done with honor. To save face and to please the Madrid government, through Belgian consul Edouard Andre, he entered into a secret agreement with Admiral Dewey and General Merritt to stage a mock battle before final surrender was to be consummated; so secret that only a few trusted commanders from both sides knew about it. By August 12, the eve of the “battle”, a final script had been carefully detailed which included targets of bombardment, troop dispositions, places of skirmishes and secret surrender signals. In Washington D.C. in the afternoon of August 12, 1898, (about 4: 30 A.M., August 13 in Manila), U.S. President William McKinley had announced the suspension of all military operations in accordance with a peace protocol between the U.S. and Spain which provided for the cessation of hostilities and the creation of a Peace Commission to discuss final peace terms between the two countries. It was reportedly, cabled on the same day but did not arrive because Admiral Dewey had cut the only underwater telegraph cable linking Manila to the world, after the May 1 naval battle of Manila Bay. The information was reportedly received only on August 16th or three days after the mock battle. 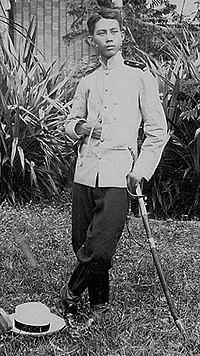 General Gregorio del Pilar was killed by the Americans in the battle of Tirad Pass during the Philippine-American war. Historical marker at Cuenca residence. During the negotiation with Dewey and Merritt, General Jaudenes strongly demanded that Aguinaldo’s forces should not be allowed to enter the city (Intramuros actually). Admiral Dewey not only agreed; he promised to exclude Filipino troops in the “battle”. Around half past nine in the morning of August 13, Dewey’s warships started bombardment of Fort San Antonio Abad in Malate, followed by the assault of the city by the troops of Generals Greene and Mac Arthur. Unsuspecting Filipino troops believing that the assault was for real, attacked from four directions: General Gregorio del Pilar took Tondo; General Pio del Pilar’s column took Sampaloc and General Mariano Noriel overran Singalong and Paco districts. General Artemio Ricarte assaulted Sta. Ana and pursued the retreating Spanish army to Intramuros, the walled city. Before noon, the mock battle was over. Manila had surrendered. The following day, the terms of capitulation was signed by American and Spanish representatives. Filipinos were left out from all negotiations. Aguinaldo and his generals were infuriated by the turn of events. Some generals wanted to settle the issue immediately by attacking the Americans but General Aguinaldo, avoiding to take any action that might trigger another war, prevailed. 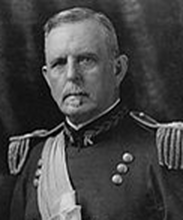 Major General Wesley Merritt asked for instructions from Brigadier General Henry C. Corbin, U.S. Army Adjutant-General in Washington regarding General Aguinaldo’s demand for a joint occupation right after the battle of Manila: “Since occupation of the town and suburbs the insurgents on outside are pressing demand for joint occupation of the city. Situation difficult. Inform me at once how far I shall proceed in forcing obedience in this matter and others that may arise. Is Government willing to use all means to make the natives submit to the authority of the United States?" 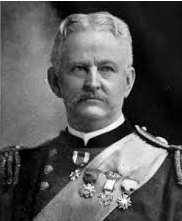 General Corbin, on Aug. 17, 1898, replied: “The President directs that there must be no joint occupation with the insurgents. The United States in the possession of Manila City, Manila Bay, and harbor must preserve the peace and protect persons and property within the territory occupied by their military and naval forces. The insurgents and all others must recognize the military occupation and authority of the United States and the cessation of hostilities proclaimed by the President. Use whatever means in your judgment are necessary to this end. All law-abiding people must be treated alike." 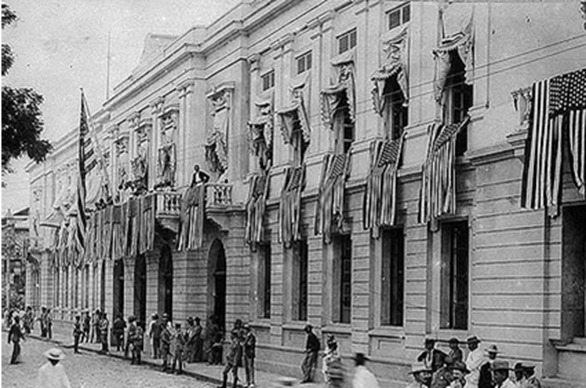 American flags adorn the Ayuntamiento, the government building inside Intramuros. 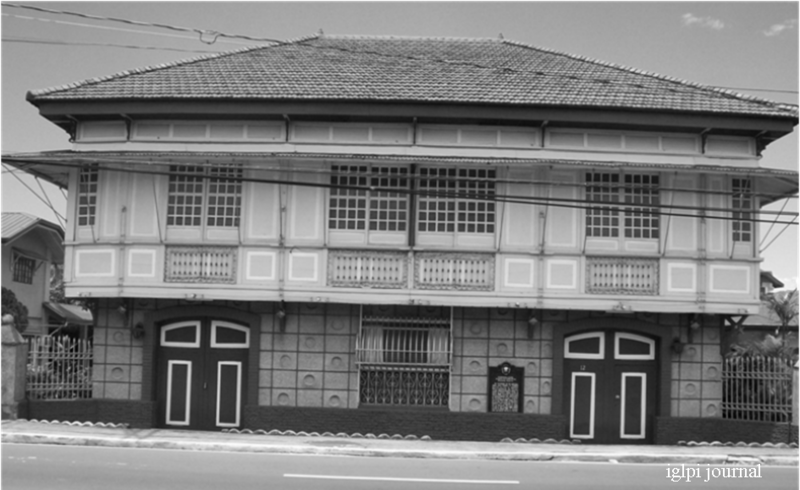 House of Juan and Candida Cuenca, seat of Aguinaldo’s revolutionary government in Bacoor, Cavite from July 15 to September 10, 1898. From Bacoor, Cavite, General Aguinaldo moved the seat of his government and headquarters to Malolos, Bulacan, 34 kilometers north of Manila. Malolos became the revolutionary capital of the Philippines. About 2000 Filipino troops marched out from the designated zones on September 15, with their bands playing American airs and cheering for the Americans; knowing only that their withdrawal was on account of a “friendly request” of their “allies”. On the same day, Malolos Congress was inaugurated. On December 10, 1898, the Treaty of Paris was signed. Following President William McKinley’s wishes, American negotiators succeeded in having the treaty provide for the independence of Cuba and the cession of Puerto Rico, Guam, and the Philippines to the United States. The only contentious issue was the Philippines because the Spanish commissioners argued that Manila had surrendered after the armistice (peace protocol) and therefore could not be demanded as a war conquest. But finally they yielded, and to placate them the U.S. government offered Spain 20 million dollars for possession of the country. 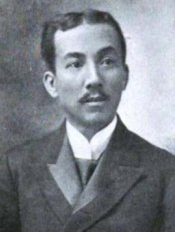 Having been rebuffed by President McKinley while in Washington, Philippine diplomatic agent Felipe Agoncillo’s last hope of being heard in Paris was likewise denied. He was not given access to the deliberations on the contention that both the U.S. and Spain had not recognized his government. On December 12, 1898, Agoncillo filed an official protest because the treaty was agreed upon without hearing the Filipino people whose future lives were at stake. The protest was not heeded. U.S. President William McKinley on December 21, 1898, declared sovereignty over the country in a strongly worded “Benevolent Assimilation Proclamation” and appointed Major General Elwell Otis as Military Governor. On January 4, 1899 Otis announced his edited version of the McKinley proclamation softening the words, “sovereignty’’, “right of cession” and “protection”, to suit the temperament of the Filipinos. However, the revolutionary government obtained a copy of the original text when it was published in Iloilo, in the Visayas.